OBJECTIVE: To explore the effect and mechanism of surround needling combined with acupoint injection on acute herpetic neuralgia (AHN). METHODS: Ninety-nine patients with T6-T10 segment AHN were randomly divided into 3 groups, 33 cases in each group, including 2 cases dropped off in the surround needling group, 4 cases dropped off in the acupoint injection group, and 3 cases dropped off in the combined group. Oral valacyclovir was given in each group, 0.3 g each time, 2 times a day for 10 days. 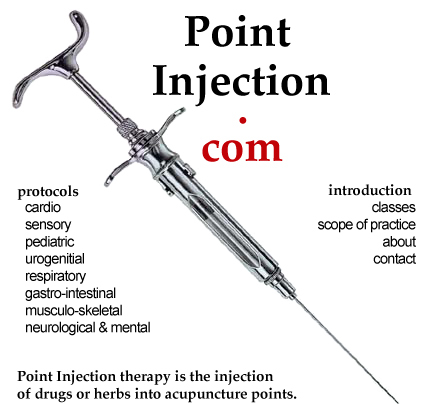 Oblique insertion of needle used at ashi points around the herpes in the surround needling group, and continuous wave was stimulated to tolerance for 20 min; the same acupoints were selected as the surround needling group, stimulated with the mixture injection of mecobalamin and lidocaine in the acupoint injection group; After the surround needling, acupoint injection was performed in the combined group. The treatment was given once a day, 14 times for a course, and one course was needed in all groups. The skin healing conditions (blistering, crusting, and dislocation time) of each group were compared after treatment. The pain scores, pain area and quality of life scores in each group were observed before and after treatment. The levels of neuron specific enolase (NSE), substance P (SP) and calcitonin gene-related peptide (CGRP) in the local blister fluid were measured before and after treatment in all groups. RESULTS: The blistering, crusting and dislocation time in the combined group were earlier than the other two groups (all P<0.05). The pain score and pain area in the each group were significantly lower than those before treatment, and the quality of life score was significantly higher than that before treatment (all P<0.05). The improvements of pain score and quality of life score in the combined group were more obvious than the other two groups (all P<0.05). After treatment, the levels of NSE, SP and CGRP in the local blister fluid in each groups were significantly lower than those before treatment (all P<0.05). The indexes in the combined group were significantly lower than those in the other two groups (all P<0.05). CONCLUSION: Both surround needling and acupoint injection have an adjuvant effect on AHN. The combination of the two is better, the skin is healed quickly, the analgesia is significant, and the contents of local NSE, SP and CGRP are significantly decreased. The mechanism of action is to exert neuroprotective effects. index.shtml was last modified Apr 25 2013.